Hair to be removed must be at least 1/8", preferably 1/4" (one quarter inch= 6 mm long). If shorter, wait a few days longer (best results are obtained letting the hair grow for 2-3 weeks). 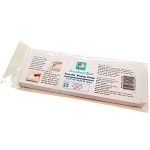 Wax, cloth strips (3" by 9" for body), spatula (best is SMARTSPATULA® with temperature indicators), moist small towel. 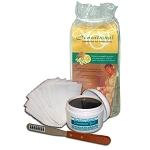 The SENSATIONAL YOU® Hair Removal Kit has everything you need for professional waxing results at home. Stir well with spatula or use SMARTSPATULA®. The wax should be soft but not runny. Test on a small area to be sure it is not too hot. The ideal temperature for application is 30-40°C (86-104°F).SMARTSPATULA®indicators change from black to green to show the temperature the wax is at. If necessary to reheat wax, place in microwave for only 15 seconds and test as before. Wash area with moist towel to remove any excess wax. Temporary redness in the waxed area is normal. Applying an ice bag to the area immediately after cleaning reduces redness and irritation. Avoid exposure of waxed skin to the sun for 12 hours. 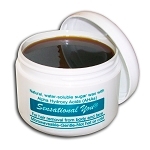 Use Quench PT ®post-treatment balm on the area to soothe the skin. In areas prone to ingrown hairs, such as the bikini, underarms, or in men's beard, apply BUMP AND BLEMISH® immediately after waxing, and after it has absorbed into the skin, apply QUENCH PT® to deeply moisturize. Avoid using make-up and other skin products for a few hours after waxing.